Part 145-approved pilot training provider FlyRight and Blackhawk Modifications have joined forces to develop a training program for operators of aircraft with Blackhawk’s engine upgrades. The tailored initial and recurrent simulator training incorporates performance and operational differences specific to the customer's aircraft. Blackhawk (Booth 4119) is offering vouchers for recurrent training with each new engine upgrade. FlyRight (Booth 4525) has its pilot training center at Concord Regional Airport in Charlotte, North Carolina, “just minutes” from Charlotte-Douglas International Airport, according to the company. Waco, Texas-based Blackhawk offers engine upgrade programs for Beechcraft King Airs and Cessna Caravans. The supplemental type certificates include more powerful versions of the Pratt & Whitney Canada PT6A-series turboprops. In addition to its King Air and Caravan programs, FlyRight also provides training in the Bombardier Dash 8-100/200/300 regional turboprops. 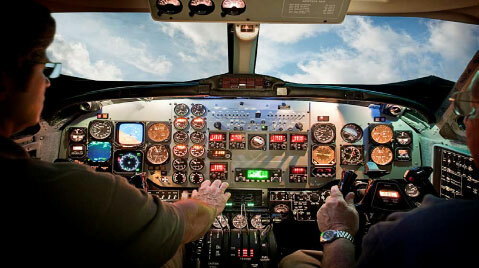 FlyRight recently introduced King Air 200 crew training, with initial and recurrent programs. “We are able to offer our clients more options for their training and more importantly, the ability to train as they fly,” the company said. The initial crew course is six days, while the recurrent curriculum runs three days. Focus is on crew resource management best practices, and also incorporates endorsements for pilot flight reviews, landing currency, and instrument proficiency. Finally, FlyRight will begin offering Garmin G1000-based training in January for the Cessna Caravan 208B. Pilots training in the level-D full-flight simulator will now have the option of using the Garmin glass-panel suite or the Caravan I analog flight deck, depending on how their aircraft is equipped. FlyRight provides initial, recurrent, and custom training with the Garmin avionics, and also offers simulator lease options.